This morning, a Kickstarter campaign for a Ghostbusters board game went live, led by Cryptozoic Entertainment. No one should be surprised to hear my ears pricked up immediately. Cooperative, modular design for high replayability, Ghostbusters. What else could it take to get me through the door? Very little, as I read through the summarized pitch on Boardgamegeek. But then I loaded the campaign page and looked at the component designs. And all I could think was, “This looks suspiciously like Zombies!! !,” which is not a good starting point for my tastes. 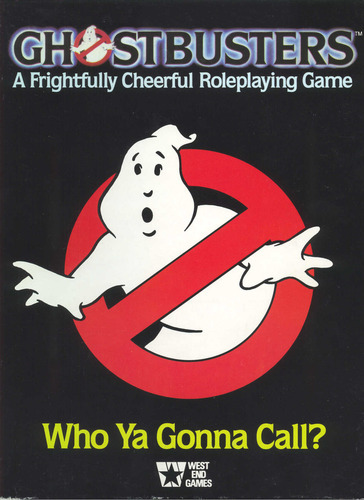 And interestingly, apparently there are many comments on the campaign page and elsewhere that, based on the initial component images and description given to date, Ghostbusters: The Board Game sounds an awful lot like Zombicide, which is another cooperative board game about beating back the undead, albeit of a different psychokinetic vibration band. There’s not much to go on about how the game plays right now, aside from demonstration participants in the Kickstarter video saying good things about it. Wherever my sense of mistrust is coming from — I have little personal experience with Cryptozoic’s board games besides one round of the DC Deck Building Game, which plays an awful lot like Ascension Deck Building Game — I feel reassured to see I’m not the only board game player looking askance. On the other hand, Cryptozoic is more than halfway to their $250,000 goal in less than a day, so there are 900+ people who have decided this game could be for them. It could be for me, too, but I’m staying wary for now. I’d love a Ghostbusters board game, but I want it to also be a game that I love, not just something based on one of my favorite movies. Dave Chapman tasks me. Oh, how he tasks me. Over the course of #RPGaDAY, the topics have circled around the idea of favorite a lot. Different flavors of favorite — rarest, never get to play, favorite rules — but generally the idea that one candidate wins the title. And I’ve found that the same names pop up again and again when I consider what I will nominate: Buffy the Vampire Slayer, Mage: the Ascension, Ghostbusters and the other usual suspects you’ll find figuring prominently in the Held Action tag cloud. While that’s fine, I’ve generally tried to make my picks more varied than calling out the same names over and over again. Finding that variety has also reminded me how many different games I like. I don’t know if I could pick a single favorite role-playing game from among them, and I don’t know that I want to. They all achieve something a little bit different, which I’ll admit when I’m not in the mood of denying that rules matter and insisting that by and large, whatever rules you prefer will do just fine, regardless of the officiality of an adaptation. You’re all astonished. I can tell. The format of a team of coworkers from various backgrounds being assigned problems has just the right mix of structure and flexibility to make it playable, in one form or another, for many, many years. Ghosts have haunted humans for almost as long as there have been humans, so you can flash back and forth along the timeline to any time in history when spiritual turbulence is on the rise. A 1920s campaign frame focusing on the restless dead of the Great War and the aftershocks of such carnage among the living has a lot of promise. It’s archetypal. It’s extensible. It’s timeless. Ghostbusters will always be my favorite, I guess. Before we go any further, I need you to brace yourself. 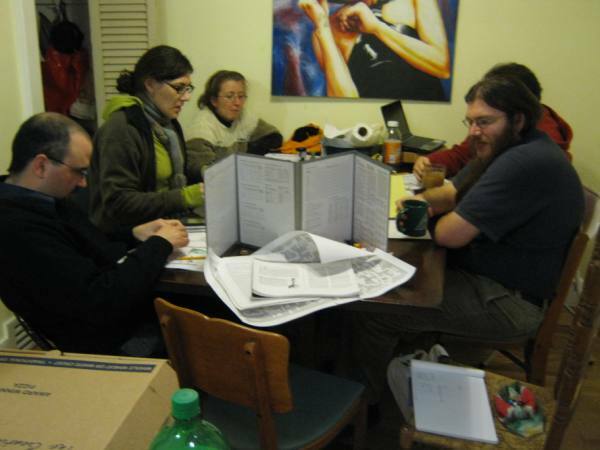 We’ve already covered that the first role-playing game I ever played was third edition Dungeons & Dragons. That’s a simple defect, though, one that could be rectified by any right-thinking GM with their copy of the red box handy, right? Maybe someday, sure, but not yet. I’ve never played or owned an edition of Dungeons & Dragons prior to third. The vast majority of games I own date from the 1990s or later. I’m a true third wave player. That said, I do own a couple games that come from the old school, or at least grew up listening to stories from the good old days. It should not surprise anyone that I treasure the original Ghostbusters box set from West End Games. I found it for a steal on eBay, misfiled in the art supplies category, or somewhere weird like that. Still in the original shrinkwrap, with pristine manuals inside, the equipment cards unpunched and, the most treasured of treasures, the ghost die — scroll down a bit to see Dungeon Mistress showing her die off. It’s old school in that it sprang forth in the heady days when anything seemed possible, and nothing had been done before, and it’s the prototype system that went on to power countless Star Wars campaigns. I’ve never actually used it, mind, because I’ve always gone with GURPS and, more recently, Cinematic Unisystem for my Ghostbusters convention games, but I love going to the plot seeds section for ideas and characters to adapt to my needs. Left to right: Lasoleg the Elf, Gringo the Halfling, Bob the Cleric and Pope the Dwarf. Fittingly, Dingus the Thief cannot be seen. The other old school title in my library is Labyrinth Lord. It’s a retroclone, rather than a vintage, but I maintain its heart is in the right place. I once ran a game of Labyrinth Lord, far longer ago than I realized until I dug up that post. It was . . . fine. Crunchier and fiddlier than I would want to deal with in a game system, but fine. And I say that recalling how Neil, the unpictured Dingus in the picture, remarked that style of rule set was really too simple for strategically interesting decisions. Neil is a 3.x/Pathfinder guru who published his own rules supplement, so you can make your own call on that. Despite knowing for months now what I want to run at Carnage this year, it took me way too long to come up convention book descriptions. That (embarrassingly minor) task is done, though, so now I turn to the great work of pulling together the many disparate threads to weave into two different wholes. There’s strange doings at the Fleming Museum. A phantasmal cat has been spied stalking the premises. Students attest to long, involved, ultimately unrewarding conversations with a giant caterpillar sucking on a hookah. The lead curator has gone missing, last seen walking into the newest exhibit: a recreation of Charles Dodgson’s study. Suit up, Ghostbusters! Characters are provided and no experience is necessary for this frightfully cheerful role-playing adventure. Looking at sedate Martense College, hidden in the rolling green hills of New England, one would never guess at the secrets lurking beneath its liberal arts exterior. (Most of the time) out of sight of the unsuspecting public lies the black school within a school, the scholomance of the Cabal, educating the next generation of wizards, vampires, faeries and more. And if a lively student body weren’t enough, reptoid hunting parties stalk the night, redcaps make mischief in the village and the hill clans of Luke’s Notch strike pacts with entities not seen in Creation since before the Great Flood. The lodge members of the Wheel of Ptah have their hands full. Join the fun! Characters are provided and no experience is necessary for this adventure, which uses a variant magic system from GURPS Thaumatology. Yes, it’s that variant magic system. I’m really going to do this and I’m really going to make it work. August is my month to design and playtest of Eye of the Qlippothim, as I’d really like to give it a runthrough at Fall-loha. Carnage in Wonderland‘s staff draw close to wrapping up game submissions in preparation for mailing the convention book all across New England. Everywhere, GMs feverishly bring together scattered ideas for adventures to compose that pitch-perfect description, launching the plot hook right into the brain of the potential player, firing their imagination with promises of derring-do or dark dealings such that they have no recourse but to list it as their number one choice on their registration form. I find myself in a similar boat. I have a general outline for my two role-playing adventures, but I don’t yet have the fine detail in place. I’ll bash out some snappy ad copy to catch the reading public’s attention, then work from there to make the reality meet the promise as much as possible. Right now, all I want to say is that one will continue the saga of Ghostbusters International’s Boston much put-upon staff, who again find themselves sent forth to the Green Mountain State, and my second ever foray into the world of the Cabal — this time with a complete refit of the magic system, no less! I will probably toss in a board game for good measure, likely Frag as I do enjoy it and find it easy to teach. Geek Mountain State just posted this: a Ghostbusters fan film, called Spilled Milk. Made by the Ghostbusters of New Hampshire costuming group, it stars the same as paranormal exterminators on their home turf, dealing with a pesky ghost in the local convenience store. The thing that tickled my own brain about this short is a lot of it is how I picture GBI-Boston looking: the modernized Ectomobile with arcane equipment hanging off the top — though I still prefer the look of the Subaru wagon — and contemporary-styled people hauling the old school proton packs. It’s a good chuckle during your lunch time.